(Phys.org) —Neutron stars, the ultra-dense cores left behind after massive stars collapse, contain the densest matter known in the Universe outside of a black hole. New results from Chandra and other X-ray telescopes have provided one of the most reliable determinations yet of the relation between the radius of a neutron star and its mass. These results constrain how nuclear matter – protons and neutrons, and their constituent quarks – interact under the extreme conditions found in neutron stars. 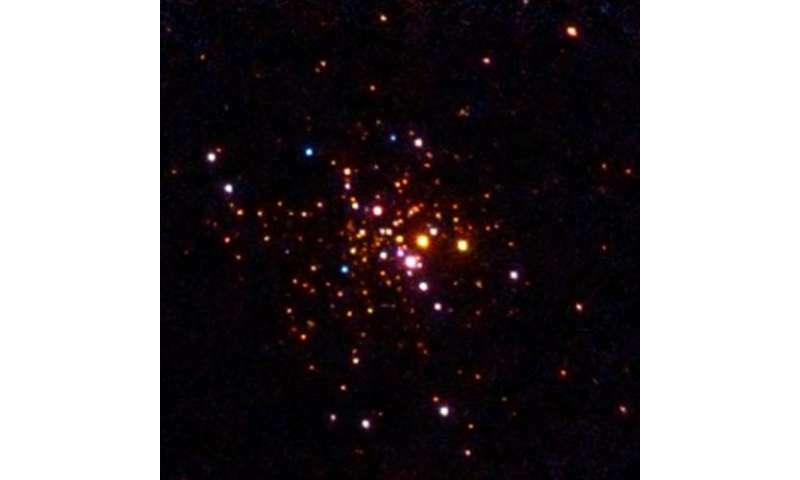 Three telescopes – Chandra, ESA's XMM-Newton, and NASA's Rossi X-ray Timing Explorer (RXTE) – were used to observe 8 different neutron stars, including one in 47 Tucanae, a globular cluster located about 15,000 light years away in the outskirts of the Milky Way. The image shown here was constructed from a long Chandra observation of 47 Tucanae. Lower-energy X-rays are red, X-rays with intermediate energies are green, and the highest-energy X-rays are shown in blue. Can someone help me out with this concept from the article: "The symmetry energy is important for neutron stars because they contain almost ten times as many neutrons as protons." I was under the impression that the reason they are "neutron" stars is that the electrons and protons in normal atoms are forced into becoming neutrons by the gravitational pressure. In that case, for the star to be neutrally charged there would have to be zero protons (or there would have to be free electrons). Both of those choices and the choice of the star being electrically charges are puzzling to me. Can someone explain what is happening? Thank you in advance. The neutron stars aren't homogeneous objects - their center is supposed to contain some positively charged strange matter or even free quarks, whereas their surface is balanced with mixture of unreacted protons and electrons, which are forming sorta atmosphere of magnetars. These charges are essentially separated due the very slow propagation of weak and isospin charge currents inside of dense matter - so that the neutrons stars can still behave like being positively charged at the surface - after all, in similar way, like the single neutron. The individual neutrons have weak momentum and positive charge at their surface too. I was under the impression that the reason they are "neutron" stars is that the electrons and protons in normal atoms are forced into becoming neutrons by the gravitational pressure. That's correct, but at the surface there is no pressure so there is a layer of normal matter on top of the pure neutron core, mostly iron. The atoms of that have the usual mix of neutrons and protons. In that case, for the star to be neutrally charged there would have to be zero protons (or there would have to be free electrons). The iron atoms include the usual bound electrons so are neutral.